After comparing many of the best hammocks available, considering size, materials, capacity, and overall beauty (aka Instagramminess), our choice for the best macrame hammock is the NOVICA Double Hammock, Manaus Majesty. It is beautiful, hand-made, extremely functional, and authentic in its design and manufacture. The hammock is hand-made by artisans in Brazil in conjunction with National Geographic, and a certificate of authenticity is supplied with the hammock. 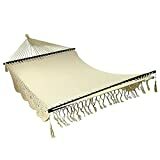 For more information on this hammock, please see our Product Reviews section. Finding the right macrame hammock can be difficult. There are loads of pedestrian, colorful hammocks that would fit right in on the campground, but often they’re not right for a serene backyard space. There is obviously a place for these hammocks, but they aren’t sublime in the way that beautiful fringe hammocks can be. The best crochet hammocks have a certain nostalgic quality to them that makes them timeless. In the right setting, they can be just the perfect object to make everything complete. Here we will look at several of the best fringe hammocks around, so get your Instagram filters ready and let’s take a look. In this article, we feature a buyer’s guide to these (often hand-woven) hammocks and cover the different aspects that define quality craftsmanship. After that, we will review several of our favorites. Here we look at some of the basics of fringe hammocks in order to inform and to give some context to the product reviews found below. Generally, these hammocks are made through either Crochet or Macrame. These two types of weaving produce similar finished products but have some slight differences. Crochet is a process of creating fabric using a single crochet hook to interlock loops of yarn or other materials. Typically the hooks are made of metal or wood. Crochet differs from knitting in that each stitch in a crochet is completed before moving on to the next stitch; knitting keeps several stitches open at one time. Macrame is a type of textile making that uses knotting as a base, rather than weaving or knitting. The most common knots for macrame are the square knot, the full hitch, and the double half hitch. Macrame in the modern era was a craft started by sailors, who would create elaborate and ornamental knots to decorate parts of ships. The sailors would make these objects while on their off time at sea and would sell them or barter with them at ports around the world. Hammocks typically come in two broad categories of design. The first type of hammock is the bed hammock, and the second is the cocoon style. Bed hammocks feature a spreader bar system that separates the weave of a rope out across a 2′ or so plane, creating a bed that forms the core of the hammock. These types of hammocks typically have a weave, and occasionally have an additional mattress, pillows, or other objects placed on top of them. They are more familiar in form to a traditional bed that westerners would sleep on than a cocoon hammock is, and at first glance, these may appear to be the most preferable. However, it is easy to lose balance when in a bed style hammock, and tip over. For this reason, we generally prefer Cocoon-style hammocks, as they are safer and allow for easier relaxation. If you’re a novice to hammocks, you may want to go for a bed style hammock, but if you have much familiarity with them, we would suggest you go to a cocoon style. Cocoon hammocks have many sub-categories: Brazilian hammocks, Mayan hammocks, Nicaraguan hammocks, etc. Generally, the region-specific names have to do with the weave types, but the main feature of a cocoon-style hammock is that it does not have spreader bars, but instead has wide fabric sides. These sides wrap around you as you enter the hammock, and create a stable base for comfort. Cocoon hammocks are much less likely to tip over than bed hammocks, and are generally recommended, especially if you plan on sleeping or even napping. When using a cocoon hammock, you generally want to position yourself at an angle to the hammock, as shown here. By laying at an angle, you can prevent the fabric from wrapping you up too much, and getting that encapsulated feeling. Also, you can often fold down the sides of the fabric somewhat to prevent it from bunching up too much around you. Unless you are very new to hammocks, or you strongly dislike the idea of fabric wrapping around you, we would suggest you lean toward a cocoon-style hammock. It is easier to get comfortable in these hammocks than in bed hammocks since you don’t need to worry about tipping over. You can sink deeper into relaxation, which is a very good thing! The most common material for fringe hammocks is cotton. Cotton is soft on the body and fairly strong to allow a good deal of support. It is a natural material, and fairly eco-friendly. It can also be washed relatively easily (though we recommend not using bleach, as bleach can damage the colors of cotton). Additionally, some fringe hammocks may contain nylon. Nylon is a synthetic fiber and is generally stronger than cotton. A nylon mix with cotton may allow a hammock to support more weight than a 100% cotton hammock would. If the hammock users are on the hefty side, you may want to choose a hammock that is partially constructed of nylon. There are several common ways of suspending a hammock. We will cover them here. If you wish to suspend your hammock from a tree, we suggest getting an eco-friendly hammock strap instead of using rope (such as this Vivere tree strap). These tree anchors wrap securely around a tree and enable the tree to properly support a hammock, without damaging the tree. Ropes can damage the bark of a tree over time, so it is generally best to avoid using rope. If you would like to attach your hammock to a wall, ceiling, or other man-made objects, you can use a wall anchor kit to support your hammock (such as this one by Ultimate Hammocks). Make sure that these anchors are attached to something solid (a stud, or other structural members) — don’t just put them into the drywall and expect them to support a heavy weight! Hammock stands are another option for suspending a hammock. If you don’t have trees in the area or want the hammock to be placed in a certain position, a hammock stand may be your best bet (such as this one by BestChoiceProducts). You’ll need to be sure that the stand is the right size to fit the hammock of your choice, so be sure to get the measurements before you purchase. If you are interested in a hammock and stand set, please take a look at our article on hammocks with stands! Here we will look at several different fringe hammocks, review them, and pick our favorites. 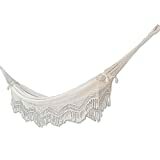 The NOVICA cotton hammock, Manaus Majesty, is a beautiful fringe hammock made of 100% cotton in a gentle off-white tone. It is Fair Trade Produced in association with National Geographic. The Manaus Majesty hammocks are made on a loom, and the fringe sides are hand crocheted in an artisan collective in Ceara, Brazil. The dimensions of the NOVICA hammock bed are 90″ x 5″ x 65″, with the full length of just under 12′. This double hammock can hold up to 450 pounds, or two people. This is a delightful hand-made fringed hammock, beautiful and functional. 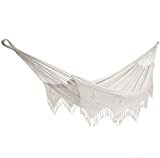 The NOVICA Manaus Majesty is a cocoon style hammock and does not have spreader bars. It can be used for sleeping every day and is great for both outdoors and indoors. The NOVICA hammock does not include any hanging accessories (just loops on the ends), so you’ll need to decide how to suspend it, and purchase the corresponding attachments. See our Buyer’s Guide for more information. If you wish to use a stand with this hammock, you should look for a 9-10′ long stand. It is best to hand wash the NOVICA Manaus Majesty hammock in cold water with a mild detergent and hang to dry. Do not machine wash or dry this hammock. While this hammock is great for outdoor use, you should not leave this hammock outside. The sun and weather will destroy it. Take it in when not in use. The NOVICA Manaus Majesty Double Hammock is a stunning, romantic hammock, and would fit great in a backyard, garden, zen space, or in an enclosed patio. It includes a certificate of authenticity. It is our choice for the best fringe hammock. 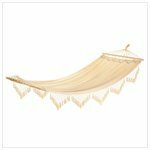 The Cape Cod Style Wood Frame Cotton Fabric Canvas Hammock is another delightful fringe hammock. It is made of 100% cotton, and the spreader bars are made of wood. The overall dimensions of this hammock are 106 1/4″ x 47 1/4″. The Cape Cod Style hammock can hold up to 250 lbs. This hammock is a bit shorter than many of the other hammocks on this list, at 8’10” stretched all the way out. If you want to use a stand with it, you’ll need to find one that is 7-8′ long, which is smaller than virtually all stands on the market. Consequently, you’ll probably want to stick with tree straps or a wall anchor kit. The Cape Cod Style Fringe Hammock is a bed style hammock, with a spreader bar, which means that it is more prone to tipping over than some other hammocks are. You’ll want to hand wash the Cape Code Style Fringe Hammock and set it out to let it dry. Use a mild detergent to clean any spots that get dirty. This hammock can function well outside, though you should not leave it outside in the sun or in the rain. Water will cause mildew to form and ruin the fabric, and excess sun will damage it as well. Best to take it in when not in use. The Cape Cod Style Fringe Hammock is quite pretty and is one of the best outdoor hammocks for the price. Still, if you can swing a little bit more, we are confident that you will find better choices among a few of the higher priced hammocks on this list. While not available on Amazon Prime, this hammock does have free shipping. The Vivere BRAZ400 Brazilian Style Double Delux Hammock is a stunning 100% cotton hammock with hand-crocheted fringe on the sides. It comes in a natural Ecru color, which is a mild off-white/cream. The Vivere BRAZ400 hammock bed is 102″ x 63″, and the total length of the hammock is 14′. This is a double hammock and is capable of supporting two people, or 450lbs. The Vivere BRAZ400 is a large, pretty, and functional crochet hammock, and is one of the best backyard hammocks out there. The hammock is quite comfortable and can be used as a hammock for sleeping indoors or outdoors. The package also includes a handy zippered bag to store the hammock when not in use. If you wish to use a hammock stand with this hammock, you should look for a 9-10′ long stand or so. Vivere recommends this stand. This hammock is machine washable on a light cycle with a mild detergent. To dry, tie up the rope ends and air dry. This hammock should not be left outside when not in use. The elements will certainly damage it, so store it in the bag when you’re not using it. The Vivere BRAZ400 double hammock is one of the best fringe hammocks on our list. The included carrying case is a nice plus, and for the price is a good deal. As an extra bonus, this hammock is available on Amazon Prime. Now with a larger hammock bed, measuring 94" x 63" for maximum comfort. The Sunnydaze DeLuxe American Style 2 Person Hammock with Spreader Bars is a very high capacity hammock with beautifully crocheted sides. It is hand woven and made of a blend of 80% cotton and 20% nylon for extra strength. The spreader bars are made of wood. The color of the fabric is a nice natural cream/tan, and each hammock will vary slightly in color. This is the one of the largest hammocks on our list, with a hammock bed measuring 83″ x 59″, and an overall length 12’4″. The hammock can support a whopping 770 lbs of weight (the nylon adds extra support) which is an interesting feature. The Sunnydaze Delux American Style Hammock is a bed style hammock, and as such there are concerns about it tipping. Especially with the large weight capacity, you may envision relaxing on the hammock and having the kids jump on, too… but beware. Even though the hammock can support a large amount of weight, it can tip and send everybody tumbling. For this reason, we lean toward the cocoon-style hammocks. This hammock fits well with up to a 15′ hammock stand (you’ll need to use chains with a stand that big though). Sunnydaze sells a hammock and stand package with this hammock, as well. You should note, though that the Sunnydaze stand only supports 400lbs. If the combined weight of the users is over 400lbs, you’ll need wall or tree anchors for the hammock. For cleaning, it’s best to spot clean with a mild detergent, and air dry. The hammock should not be left outside in the weather and should be stored when not in use. While the fabric dries out fairly quickly, cotton will degrade when subjected to a lot of sun and rain. This is a contender for the best outdoor hammock if you’re looking for something big with a large weight capacity. It is pretty, hand-made, and well constructed. A big additional feature we like is the 1-year warranty Sunnydaze includes on this hammock. You can be comfortable they stand by this product. As a bonus, it is available on Amazon Prime. The American Deluxe Style Mayan XL Hammock is another stunning crocheted fringe hammock. The bed is hand-made of 100% cotton, and the suspension fabric is nylon for extra weight capacity. The hammock is colored naturally in ecru, a mild off-white cotton color. This hammock is a large bed hammock, capable of holding a good deal of weight. The overall length is 12’5″ and the width is 55″. The bed can hold up to 770lbs of weight. The Mayan XL Delux hammock is handmade in the Yucatan, in Mexico. It is a bed style hammock, and as such, there is a risk of topping over when using this hammock. It is quite big, so the toppling risk is mitigated somewhat for a single person, but multiple people may cause it to get unbalanced, especially when used for sleeping. This hammock can go on a stand up to 14′ long. Keep in mind that the stand may not be rated to hold as much weight as the hammock, so beware. To clean this hammock, it is best to spot clean with a mild detergent, and air dry. You can soak it in the tub and then dry it, but it cannot be washed or dried in a machine. The American Delux Mayan XL Hammock is a beautifully-crafted hammock and is quite comfortable. It is well constructed and is quite soft. It is one of the best crochet hammocks around. As an extra, the Mayan XL is available on Amazon Prime.